Book your hotel in the 8th district of Paris! Are you looking for a hotel in the 8th district of Paris? Are you dreaming of admiring Paris's most beautiful avenue from the comfort of your hotel room? From the Place de la Concorde, where the Paris Obelisk stands, to the Arc de Triomphe, stretches the Avenue des Champs-Elysées, one of the French capital's key tourist attractions. Your stay could also be an opportunity to visit many prestigious architectural, cultural and artistic sites that lie within the 8th district of Paris. 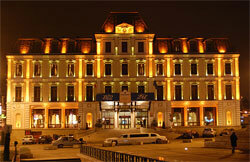 Inexpensive or luxury hotel in the 8th district of Paris? What are your expectations for your Parisian stay? While many luxury hotels are well-established in the 8th district of Paris, more modest hotels are certainly not lacking either. So it's over to you to decide the standard of comfort that you're seeking. Whatever that might be, be sure to book your hotel in Paris at the best price! Our team negotiates conditions with hoteliers to enable you to take advantage of the most advantageous rates. Book your hotel with ease through Atel-Hotels.com!